Freeze is 3/4 Holsteiner by Lansing out of Audrey Girl GNZ, who is by Littorio. Audrey Girl GNZ’s dam line hosts the fantastic thoroughbred bloodline of “In The Purple”. This filly has superb breeding pedigree. Lansing/Littorio’s are sort after and not easy to come by – certainly not one with the potential of Freeze. 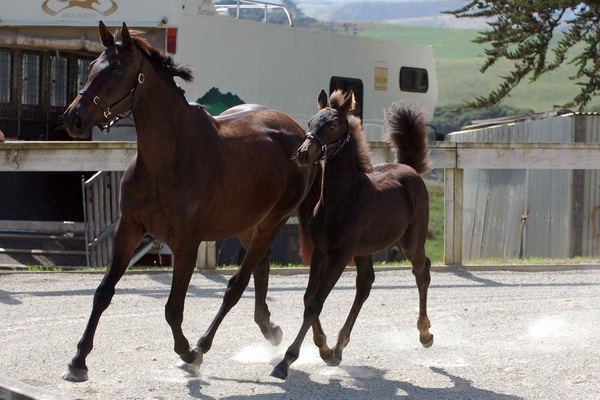 Classified in 2007 by Tim Peters from the Breeding Commission at the Holsteiner Verband, Tim’s comments on her movement were that she had fantastic movement. He gave her a solid 8 and said that if he could have give half marks it would have been 81/2 – almost a 9! Big praise from this second generation Holsteiner Breeder (who breed great approved stallion “Quick Nick”). Freeze was started under saddle by Dave Marshall of DM Training in late 2009 and is being prepared for competition. She has an awesome temperament and attitude to her work. Her jumping bloodlines are second to none and are always displayed in her free jumping schooling. Her favorite pastime is jumping down the free lane then out of the arena. She is likely to mature to 16.2 hh and is ready to go out under saddle or start a breeding program. She will be a huge asset in any yard. By Lansing and a Granddaughter of Landgraf, the most famous Holsteiner of all, and out of a Littorio/In The Purple mare. What more could you wish for! Truly the best breeding lines!